“I am an enceph in a glass vial. I am a visual-auditory-tactile artist. I do not despise the material thought wandering in the spirit and in the humour”. During the first part of his life he did not have much painting. 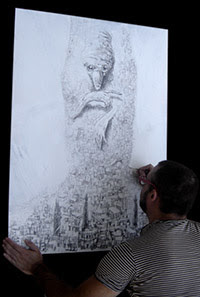 He drew horrible figures that seem to come from his emotional states. they were monochromatic designs with a strong black presence. Petrelli was not peaceful and that you could see from his life that was quite messy. For ten years, Petrelli lives happily with his partner away from the city. He has painted a lot in these years. Eclectic and visionary artist, he directs his profession in the world of visual design, CAD modelling and visualization of three-dimensional photo-realistic of real environments. “My job” he says “was a constant training on the use of compositional spaces.”. It is precisely in this area that he is operating, collaborating with leading architects and interior design businesses. The last years he has taken part in national and international competitions. His virtual installation Attraction is most notable and it was selected among the top thirty finalists of Brain project.eu. International Visual Arts competition. Artists, come from 55 different nations, were taken in it. In 2007, the work was published on the event catalogue and shown in Trieste. Michele Petrelli is a wide-ranging artist, whose production is full of novelty and experimentation. Author of illustrations and comics, he published the graphic novel A work of the Devil and Kiu.His painting, which shows a complex mastery of the subject, is clearly influenced from the world of comics and occult. He loves strong signs of the palette knife and the sign of graphite, matching few colours of the same brightness but of different shades and ranges. Despite the beneficial influences of the past, its maturation will makes him an original creator of an his iconographic language. Drawing is dominant and emerges from his chromatic painting board, becoming more often the primary importance for the composition. The subjects of his later paintings are mysterious and disturbing characters, humorous transfigurations of common people, deities or monsters. His several paintings is shown at Gallery Tornby, Bindslev – Danimarca. Michele Petrelli describes the modern world through splashes of colour accurately matched following the nature of colour itself. It settles on objects and reflexes itself through ambiance following the physical laws of light. The visual talent observes matter in analytic way, but also trascending and abstract it with a personal taste, mere realism. The choice of sequences is permeated by the heart’s vibrations, more than the ones of the mind and contributes, together with tecnique and big size canvas of the artworks, to create an emotional explosion in the observer. The iconografic style is derived from a personal, “luminous” modern impressionism. The synthesis doesn’t simply affects the strong line of the palette knife, the fast brushwork, or the reduction to monocromy or bicromy. In these “impressions” Petrelli freezes the most inner expressions. His romantic portraits of woman many times seem to emerge from a homogeneously diluted and immaterial background. The faces lose their contours and are "eaten" by the color. It drains down in some apparently random shapes. These modern women are transformed by the artist into eighteenth-century ladies. But he borrows only the styling of that time. He does not want to imitate the way the artists of that time. And here it becomes strong the adjective "New Impressionism" or "Modern Impressionism". All this is reinforced by the pictorial technique that Petrelli adopts. 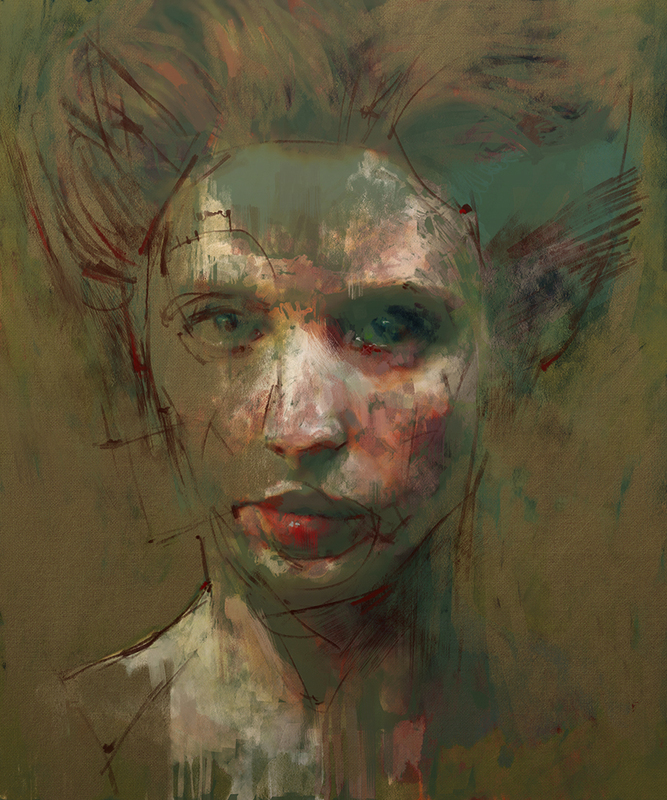 In addition to traditional painting, he uses digital painting for a first study. To do this, modern artists study and utilize different software that includes the use of an optical pen. Only those who is already very familiar with the traditional drawing techniques can eventually become a master in these computer tools. the painter uses digital painting for a first study. 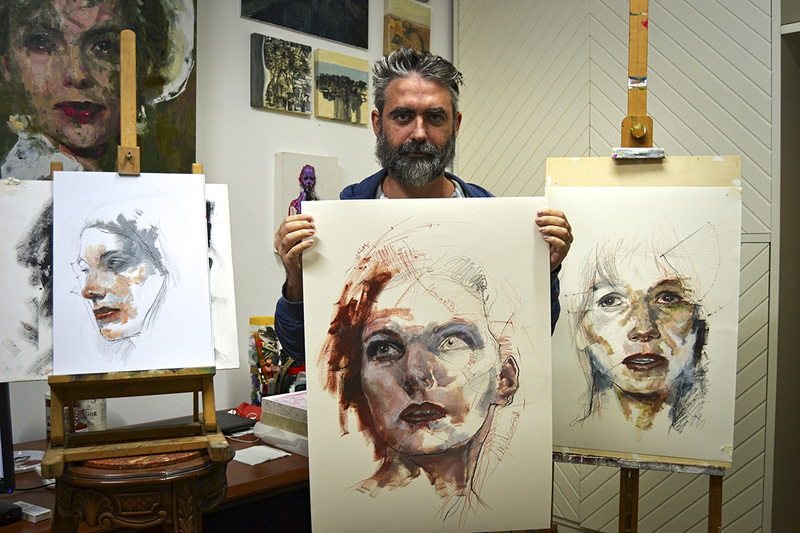 The artist paints the female face crossing the oceans of human emotions. Favorite artists, masters and sources of inspiration are: Rembrandt, Van Eyck, Rubens, Hals, Van Dyck, Vermeer.